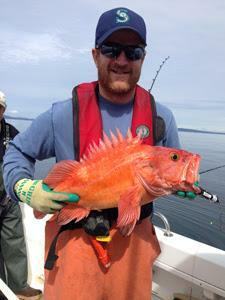 Can Anglers Help Recover Puget Sound Rockfish? 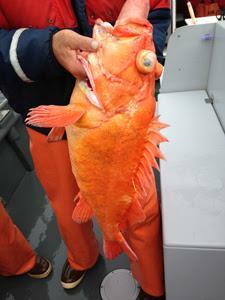 Today’s feature, on Pacific rockfish that live 75 to 100 years, comes to us from NOAA Fisheries. Rockfish don’t put up a fight like Chinook salmon (Oncorhynchus tshawytscha), so what’s the allure of catching them? Quite simply, they’re tasty. Randy Jones, a charter boat captain from Bremerton, remembers being about 10-years old when his dad was a commercial fisherman off Westport on the Washington coast, where the catch included yelloweye rockfish. But these tasty populations have been in decline in Puget Sound for decades, in large part due to the species’ late maturation. Yelloweye rockfish (Sebastes ruberrimus)-aka red snapper or rockco-can live for more than 100 years and canary rockfish (Sebastes pinniger) for more than 75 years. Both species take more than a decade to mature and reproduce. This means that mature individuals taken by fishermen reduce reproductive potential and juveniles don’t mature fast enough to replace them. After decades of commercial and recreational fishing on these species, decreases in catch were observed in the 1980s and the state began to impose catch limits. Some species, however, continued a dramatic decline in numbers, and in 2010 Puget Sound/Georgia Basin yelloweye and canary rockfish were listed as threatened under the U.S. Endangered Species Act (ESA). Captain Jay Field of Dash One Charters and NOAA biologist Kelly Andrews prepare to release a 37 cm subadult yelloweye rockfish in the San Juan Islands. Now that these depleted populations are protected, NOAA is working to restore them. An important goal for managing recovery is to identify genetic differences between these rockfish populations in Puget Sound and those on the outer coast to better define the boundaries of the distinct population segment (DPS), which is the smallest division of a species that can be listed under the Endangered Species Act. That task fell to biologist Kelly Andrews and fellow researchers at NOAA Fisheries’ Northwest Fisheries Science Center (NWFSC). They decided to partner with experienced recreational charter boat captains and expert anglers who used to catch these elusive bottomfish. Even if it won’t happen in their lifetime, many of these anglers want a sustainable fishery for their children, the next generation of anglers. That’s how the rockfish research voyages of several charter boat captains, including Randy Jones and anglers such as Ray Frederick, were born. Andrews believes this research will be of great interest to anglers, because genetic information can inform fisheries management and the recovery of the species over time, which can impact economic activities related to charter and recreational fishing. The sampling could also point to the key answers about the populations themselves. Genetic diversity is one of the keys of healthy populations, and understanding how closely related these fish are could help determine that. After obtaining NOAA research permits to catch members of a protected species, and several spring shake-down cruises off the San Juan Islands and Whidbey Island to test methods, the team is sampling selected locations this summer. “We have six to eight captains available for fishing days,” Andrews said. Most of the charter boats are in the 25 to 30 foot range and can hold six passengers, but he said most captains want three or four anglers fishing at a time. They are fishing mostly below 150 feet for adults of these species. Canary depth ranges vary, but yelloweye are typically deep, with most being caught below 250 feet. Kelly Andrews with a 56 cm yelloweye rockfish. But he also couldn’t resist the chance to do a little “rockfishing” again when the opportunity arose. “I’m a tried and true Chinook salmon fisherman,” Field said, “but I caught plenty of rockfish in the past.” He said the bottom is “snaggy and grabby,” which runs the risk of losing some expensive gear, “but if you’re not fishing at the bottom, you’re not fishing where they live.” He also noted that “Everybody does things a bit different. I fish more bait than hardware.” Evidently his technique works for him, as he caught several yelloweye, one about 17 pounds, over two feet long, and potentially 100 years old. The sampling is designed to be nonlethal. Scientists note the gender, measure total length and weight, cut a small piece of caudal fin for a genetic sample, then release the fish. While fishing at these depths can cause physical stress due to rapid changes in barometric pressure while being reeled to the surface, rapid recompression to captured depths may alleviate external signs of barotrauma. Bottom-dwelling rockfish are susceptible to barotrauma when they are quickly brought to the surface, with symptoms including “pop-eye” as shown here. Immediately after data collection, the researchers clip the mouth of the fish to a pressure-activated descending device called a SeaQualizer, which quickly takes the specimen down to the appropriate depth for release. However, more research is currently being conducted to determine long-term survival after decompression. Even if fish do not resurface they may have injuries that later lead to death. The caudal fin samples are collected from the fish and sent to the NWFSC laboratory in Seattle for genetic analysis. By comparing the genetic profiles of rockfish caught in Puget Sound with those on the outer coast, we can better understand the level of difference between these populations. By collecting samples from several regions of Puget Sound and the surrounding areas, we can identify geographically where differences in these populations occur. Answers to these questions will better inform spatial management boundaries and recovery actions for these species. Biologists record GPS location and depth of catch, length, weight and gender of fish, snip a small piece of the tail fin for a genetic sample on every fish collected and attach a Floy tag into listed rockfish. Each fish is on board for approximately one minute andthen released back to the water, either on their own or using a descending device. 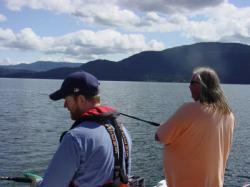 Approximately 30 – 50 fish are sampled per angling trip. While the NWFSC scientists and their community partners are out on the water, and the geneticists are running DNA sequences, Jennifer Sawchuk, a marine ecologist in the NOAA Fisheries Protected Resources Division, is working with an team of experts from various organizations to draft the rockfish recovery plan for canary and yelloweye rockfish, and a third ESA-listed species, bocaccio (S. paucispinis). Just as the scientists have been working with the recreational fishing community, such partnerships are integral to her recovery planning efforts. Previously as a University of Washington graduate student she interviewed more than 500 anglers in Puget Sound to gain an understanding of their knowledge about rockfish, perceptions of threats to rockfish, fishing practices, and preferences for recovery measures. The results of her study have informed NOAA’s outreach and education efforts around rockfish, as well as understanding how to better utilize angler’s knowledge about marine resources. “We’ve done several projects over the years that involve experts and the public in recovering yelloweye, canary, and bocaccio, and much of that work has been with the regional fishing community,” Sawchuk said. After internal review, co-manager and scientific peer review, and subsequent public review, a final recovery plan for these species in Puget Sound is targeted for release in 2015. This entry was posted in Conservation, Saltwater Fishing on September 30, 2014 by ronniegarrison. How Can I Catch Early Fall Trout? Across the spectrum of hunting, fishing and other outdoor pursuits, autumn is truly a time of plenty. And one of the more overlooked opportunities involves the early fall trout bite. The action often gets lost in the shuffle of activities. But the fact remains, September produces fine fishing afoot and afloat for anglers who understand a bit about fall trout behavior. All three scenarios hold potential for string-stretching excitement, not to mention the reward of fine dining on fresh trout. To help you make this your best fall ever, Keefe offers the following tips to capitalize on each situation. In Keefe’s stomping grounds around the high-country paradise of Granby, Colorado, early to mid-September sees a smorgasbord of rainbows, browns, cutthroats and cuttbows relating to near-shore weedbeds. “Ideally, you have three to four feet of open water between the weed tops and the surface,” he says. “Which makes it easier to fish lures just over the vegetation.” Because trout often prowl open pockets in the salad, Keefe keeps an eye out for such clearings, and religiously fishes baits in and around them. His go-to rig in the greenery is a 1/16- to 1/8-ounce black Eagle Claw jig head tipped with a 2 ½-inch, smelt-pattern Berkley Gulp! Minnow, suspended beneath a small clear casting bubble or float. Autumn is a great time for catching all types of trout, from sag-belly lakers to ‘bows, browns and more. Strikes are often light. “Stick bobbers often just tip over, while bubbles betray bites by rocking and sliding across the surface,” he says. When trout are on a tear, Keefe favors more aggressive tactics. “Small, metallic-finish spoons like the Lindy Viking are great for active trout,” he says. “Though I do replace the treble with a single hook, which makes the spoon a little more weedless.” He favors fast-paced retrieves laced with rips, flutters and twitches, but cautions to always keep the spoon above the salad. “Lift-drops are dynamite for rainbows and browns in the weeds,” he adds. As autumn progresses and vegetation dies back, trout often frequent languishing weedbeds. Rocky shorelines and points can also be productive. “Anywhere the bottom changes on a point, giving crayfish and minnows a place to hide, can be hot,” he says. A variety of presentations hold water here, including tube jigs dragged on bottom, a leadhead and Gulp! Minnow combo fished slightly higher, and a number of slender minnowbaits, spoons and spinners. While close proximity to deep water is a plus, Keefe says it’s not mandatory. 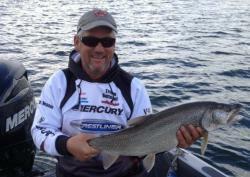 Besides offering fine fall fishing, kokanee salmon often hold the key to lake trout location. On the lake trout front, Keefe follows migratory lakers toward their autumn spawning grounds. “In early fall, though, it’s more a matter of tracking trout that are feeding on kokanee salmon,” he notes. “Inlets and the mouths of large bays often attract prespawn salmon, and lakers follow.” When he spots trout harassing a kokanee congregation, Keefe plies a variety of presentations, including tube jigs, spoons and hair jigs. While autumn’s many opportunities may distract fair-weather trout fans, the season holds options for solid action. Follow Keefe’s guide-tested tips and make this your best fall ever. For more information or to book a trip with Keefe, visit: fishingwithbernie.com or call (970) 531-2318. This entry was posted in Trout and Salmon on September 28, 2014 by ronniegarrison. Lake Lanier was the site for the November Spalding County Sportsman Club tournament a few years ago. Nine of us fished for eight hours and caught 19 bass weighing 31 pounds,15 ounces. That is a good average size for any lake and it is even better if you know most of the bass we caught were spotted bass. They tend to be smaller and lighter than largemouth. James Pilgrim, Jr. had a limit of 5 keepers that weighed 9-2 for first. He had one of the prettiest spots I have ever seen, a 4 pound, 4 ounce fish that took big fish honors. Kwong Yu also had a limit and his 7-7 weight was good for second place. David Pilgrim had 4 keepers weighing 6-0 for third. I caught only two spots but they weighed 5-8 and that was good for fourth place. I caught one on a jig and pig at 8:00 am and the other on the same bait at 2:00 pm. Both were on rocky points. My big one weighing 3-8 was the biggest spotted bass I have ever caught, but it wasn’t quite big enough! James, David and Kwong said they caught their fish on worms in fairly deep water. They were fishing brush piles 20 to 30 feet deep. I am always amazed how deep the fish hold at Lanier. The shad I saw on my depthfinder were all 35 to 40 feet deep and other fish were holding under them. I caught a couple of little hybrids jigging a spoon in 40 feet of water. I never fish that deep on other lakes. I guess it is the clear water at Lanier. If you try Lanier anytime soon, plan of fishing deep water. Jigging spoons are a good way to fish that deep. The pro fishermen found similar conditions at Lake Russell that year. They also caught fish deep. The winner jigged spoons and slow rolled a spinnerbait through standing timber in 30 feet of water. Russell also has very clear water. Remember, the clearer the water, the deeper the bass will usually hold. This entry was posted in Bass Fishing, How To Fish, Tournament Fishing on September 27, 2014 by ronniegarrison. In an earlier article I mentioned a plug bass pro Bobby Padgett uses to catch fish on the ledges at Eufaula. A company in Columbus, Stanford Lures, is making the Cedar Shad. They also make the Hog Caller spinnerbait you see in local stores sold by another company. The Cedar Shad is carved out of Western Cedar, runs about 10 to 12 feet deep and has excellent colors. It is guaranteed to run true right out of the box. Most crankbaits need tuning before they will run right but the Cedar Shad doesn’t. I expect this company to sell a lot of quality lures that are made in our state. Crankbaits are excellent lures year round. Bobby Padgett’s favorite time to use them is May through the fall when the bass are stacked up on ledges and deep structure. He says his type fishing is feast or famine, catching either dozens of good bass or nothing. I really like crankbaits this time of year. I am usually looking to catch one or two fish, just to place in a club tournament. Crankbaits fished slowly around rock or wood cover in shallow water will usually pay off in a few strikes even on the worst days. Its tough deciding whether to go fishing or hunting this weekend. Doe days are open in Spalding County and other counties toward Atlanta. Other counties do not have doe days until Thanksgiving, but bucks should still be moving. I need a couple of deer for the freezer, but catching bass sounds good, too. This is a great time of year! This entry was posted in Bass Fishing, Fishing Product Reviews, Fishing Tackle on September 25, 2014 by ronniegarrison. What Is A Ripe Sturgeon? When a crew of biologists from the Maryland Department of Natural Resources hauled a gill net out of the Marshyhope Creek in late August, what they hauled in was more than the catch of the day: It may have been the catch of their careers. One of the nets contained two “ripe” – ready to spawn – Atlantic sturgeon. One was a 7-foot 3-inch, 154-pound female. The other was a 5-foot 2-inch, 70-pound male. The female was filled with black eggs, and the male was leaking sperm. The recent catch ended more than two years of frustration for the biologists. Fishermen have reported seeing sturgeon jumping in the Marshyhope for several years. Last fall, one landed in the boat of two anglers. But crews from the DNR and the U.S. Fish and Wildlife Service had – until Aug. 28 – failed to net any sturgeon. The previous week, in fact, Stence and his crew saw one jump only about 40 feet from their boat, but they were unable to net it. “It’s so frustrating when you see them jumping right in front of the boat, and you still can’t catch them,” he said. That frustration ended as they were pulling in the last of four 100-yard gill nets that had been deployed on the 28th. Atlantic sturgeon are the largest fish native to the Bay, where they historically reached lengths of up to 14 feet. Once common, they suffered from overfishing, habitat destruction and pollution, resulting is a dramatic population drop in the last century. Two years ago, the National Marine Fisheries Service listed them as an endangered species. Like other anadromous fish, sturgeon live most of their lives in the ocean, but return to their native rivers to spawn. The James River is the only Bay tributary known to still have a spawning population. But the catch by DNR biologists could change that. “I can’t imagine a fish that big going up in there for any other reason other than to spawn,” Stence said. Actual proof of spawning would require finding recently spawned “young of year” fish in the river. Right now, Stence said, no surveys exist in the vicinity of the Marshyhope that would catch young of year sturgeon. Now, with evidence that suggests potential spawning activity, the fishery service will consider starting one, he said. It’s also unknown where the sturgeon came from. They could be remnants of a native Maryland population that has gone undetected for decades. It is possible, some have suggested, that they are James River fish that have wandered up the Bay. Another possibility is that they stem from a small batch of juvenile Hudson River fish that were released in the Nanticoke in 1996. Those questions could be answered in coming weeks. The biologists took DNA samples of both sturgeon for analysis. Biologists would like to know what habitats the fish are using. So the captured sturgeon were briefly anesthetized and the biologists made minor incisions to insert a small transmitter and a tag so they can monitor the strugeons’ movements and identify them in the future. After that procedure, the biologists jumped into the chest-deep water and cradled the fish, “like babies,” Stence said. After about 10 minutes, the sturgeon recovered and swam away. But Stence said, the biologists are optimistic that they have not seen the last of sturgeon on the Marshyhope. Indeed. Last Friday, they caught another 97-pound male. 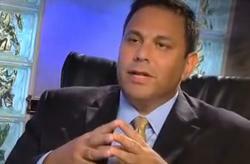 Karl Blankenship is editor of the Bay Journal and Executive Director of Chesapeake Media Service. He has served as editor of the Bay Journal since its inception in 1991. This entry was posted in Conservation on September 24, 2014 by ronniegarrison. 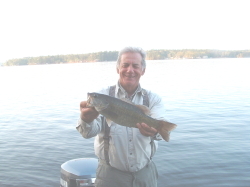 I had the chance to fish Lake Eufaula a few years ago with Bobby Padgett. He knows the lake well since he grew up in Columbus and still lives there, fishing Eufaula about twice a week. He won a BASS tournament there in May, 1996, bringing 15 bass weighing 77 pounds, 9 ounces to the scales. That weight set a new record for a three day, five fish limit tournament. My trip with Bobby was to mark ten places to fish for bass in December for a Georgia Outdoor News article. It was unbelievable the way he found fish. We could be riding down the lake and he would slow down, circle an area, throw out a marker and say cast there. We would be so far from the bank you could not have hit it with a rifle shot! Sure enough, we would catch fish. Bobby fishes the ledges on Eufaula with Mann’s 20 Plus crankbaits and Cedar Shad crankbaits. We were fishing ledges that were shallow even though in the middle of the lake or its major creeks. When we cranked the plug down and hit bottom in about 12 to 15 feet of water, and then bumped a stump or brush, a bass would often grab the plug. Although we did not catch any bass over 5 pounds and Bobby said it was a bad day, I was amazed. Fishing only half a day, we probably caught 30 bass, and had about ten 16 inch keepers. Several of them weighed better than three pounds. According to Bobby, there are more 16 and 17 inch bass in Eufaula than he has ever seen before. He had been catching at least 25 keepers each trip, and had several over five pounds each time before I went with him. I can bring bad luck to anyone! He was nice enough to blame it on the cloudy weather rather than me. You can catch bass like that at Eufaula now. Find shallow ledges on a lake map and crank a plug down to hit them. Concentrate on brush if you find any. The bass will also hit worms and jigs, but a crankbait allows you to cover more area quickly. There were big bass there last week. As I said, if it wasn’t for bad luck, I wouldn’t have any luck at all. Late in the afternoon, I cranked my 20 Plus down and hit brush. A bass grabbed it and, when I set the hook, it pulled my rod tip to the water. I had just caught a three pounder that did not pull my rod tip down at all. Bobby said I had a grown one. About the time I agreed, the fish pulled off. A little later I was cranking a Mann’s Loudmouth on a more shallow hump. It stopped like it hit a stump and when I set the hook, a bass almost pulled the rod out of my hand. It also pulled off after a few seconds. I was using heavy equipment with 20 pound line, and Bobby said I was tearing the hooks out of the mouth of the big bass. He uses 12 pound Stren Easy Cast line on all his reels. I guess I should have changed to lighter line after losing the first one. In the BASS tournament, Bobby landed one weighing 10-1 for big fish. He caught it on a deer hair jig. He caught a couple on that jig while I was with him. He showed me a way to fish jigs that I will have to learn. It is different from the way I fish now but it definitely works. Bobby finds a fairly smooth point or ledge, casts the jig out and lets it sink on a tight line. When it hits bottom, he holds his rod tip at about a 10:00 angle and cranks the reel handle two or three times to swim it off the bottom, then lets the jig sink back on a tight line. The rod is at the right angle to set the hook if a bass hits. He does not pump the rod tip. The jig looks like a shad swimming up and then darting down to the bass holding off the bottom. You have to set the hook hard and fast when one hits. This method also works with a Mann’s George-N-Shad. Bobby gave me one to use, showed me how and I quickly missed several strikes. I do plan to learn this new method! This entry was posted in Bass Fishing, How To Fish on September 23, 2014 by ronniegarrison. Today’s feature, on the growing issue with Mexican poachers in U.S. waters off Texas, comes to us from Chad Wilbanks with the Gulf Coast Leadership Conference. It seems every week brings another story of U.S. Coast Guard or other Gulf Coast maritime law enforcement giving chase to foreign fishermen sneaking into U.S. waters to fish illegally. Foreign illegal fishing in the Gulf, mostly by Mexican crew in boats called lanchas, is a persistent and alarming problem according to authorities from Gulf Coast states, as well as the federal government. At a recent leadership summit at the Texas A&M University in Galveston campus, the urgency of the issue brought together a diverse group of stakeholders; commercial and recreational fishermen, state and federal fisheries enforcers and elected officials. Participants focused on how best to combat illegal fishing, and was hosted by the Gulf Coast Leadership Conference. Both commercial and recreational fisheries are an economic engine in the Gulf of Mexico driving jobs, tourism, state revenue and sustainable seafood. According to the National Marine Fisheries Service, the Gulf of Mexico’s commercial and recreational fishing industries support more than 168,000 jobs and contribute $13.7 billion annually to the region’s economy. That significant economic lift reverberates far inland. Illegal and unreported fishing accounts for up to $23.5 billion worth of wild-caught marine fish globally, or around one-in-five fish harvested worldwide. That equates to up to 1,800 pounds of fish stolen every second. Aside from the theft of the fish, so-called pirate fishers show stark disregard for the marine environment. Often they sets miles of nets or lines that indiscriminately kill marine life, including endangered turtles and other imperiled species. Comprehensive statistics on illegal fishing in the Gulf are scarce, but according to Lt. Les Casterline with Texas Parks and Wildlife Department Fisheries Enforcement, just one of his wardens in fiscal year 2012 recovered 130,080 feet of illegal long line and 53,840 feet of gill net. “That gear alone held more than 6,000 sharks, 300 red snapper and an uncountable number of Spanish mackerel,” Casterline said. A key tool to solving illegal fishing is federal legislation that will tighten the net on illegal fishing operations. In April the U.S. Senate voted unanimously to approve the Port State Measures Agreement, which would strengthen and harmonize port inspection standards for foreign flagged fishing vessels. 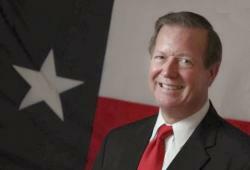 The agreement cannot take effect however until House of Representatives passes legislation to implement the pact. “Illegal fishing could pose a serious economic, environmental, and human rights threat to Florida and the Gulf region,” said Fuentes. He cited numerous recent media stories on how illegal fishers around the world enslave workers, often keeping them at sea for years in deplorable working conditions that often result in the murder of dissenters. The United Nations Office on Drugs and Crime has also linked pirate-fishing fleets to drug and migrant smuggling around the world. Fleeing capture by Gulf law enforcement, outlaw crews have shot at officers hoping to create enough of a head start so that they can live to fish another day. Those caught face relatively light consequences: confiscation of their boat and repatriation to Mexico. Experts say this fails to deter offenders, with some illegal fishermen getting caught as many as eight times. Foreign illegal fishing is “the number one topic” among South Texas charter fishermen, according to Scott Hickman, a board advisor with the Charter Fishermen’s Association. “Illegal fishers are taking the ability from the charter industry to make a living. Our members see it every day. We need somebody guarding the fence,” he said. The challenge for U.S. authorities is clear: clamp down on current illegal fishing and implement policies to better prevent it from occurring in the future. According to Gulf Seafood Institute president Harlon Peace, if that doesn’t happen soon the Gulf seafood industry faces an uncertain future. This entry was posted in Conservation, Saltwater Fishing on September 22, 2014 by ronniegarrison. Fishing West Point with Ed Sheppard a few years ago reminded me again why fall fishing can’t be beat. We had a beautiful day with bright sun, clear calm water, bank trees beginning to show some color and air temperatures in the upper 70’s. To make it even better, we didn’t see a dozen other boats on the lake. Although Ed was showing me some holes for a Georgia Outdoor News article, we stumbled on something that might interest you. While in the back of Turkey Creek above the boat ramp, a big school of hybrids surfaced around a small island. They stayed on top for almost an hour, feeding on the schools of shad that were everywhere. Ed caught a couple on a Rat-L-Trap while I stubbornly casted a spinnerbait and bumped it on the bottom, trying to find a big largemouth feeding under the hybrids. I didn’t have any light equipment and I needed a big largemouth for a picture. I didn’t get one. If you go to West Point, carry an ultralight and tie on a quarter ounce jig. White or yellow should be good. You probably can catch hybrid after hybrid weighing a pound to a pound and a half. They will give you a super fight on light tackle. Shad were on top everywhere we fished late in the afternoon. Check backs of creeks as well as open water. Watch for schools on top the last couple of hours of light. They are easy to spot if there is no wind. With or without wind, keep your gas motor off and listen. You can often get the direction of a school by hearing them when the hybrids start hitting. When you find a school, ease up to them and don’t spook them. If they go down, wait a while and they will probably return. We also enjoyed watching a couple of osprey diving and picking up shad off the top. They would fly back to a tree, eat the shad and return for another. These majestic brown and white birds are firmly re-established in our state. When I was growing up, there were not any to watch. They add to a day’s fishing. This entry was posted in How To Fish, Striped Bass and Hybrid Bass Fishing on September 21, 2014 by ronniegarrison. I tried a new fish stew recipe last weekend that is mighty good on these cold, rainy fall days. If you like New England style chowder, you will like this fish stew. Brown a couple of strips of bacon in a pot. Remove the bacon and cook a large chopped onion in the grease until clear. Add three cups of chopped potatoes and the crumbled up bacon, cover with water and cook for about 15 minutes. Add two pounds of bass or crappie filets cut into chunks, half a stick of butter, salt and pepper and cook until the fish and potatoes are done. Add 16 ounces of evaporated milk and stir until hot. Like all fish and stew, this is even better fixed ahead and warmed back up. Add a chopped stick of celery and a carrot for more flavor. Since I am allergic to milk, I used rice milk rather than evaporated milk. It is not as rich and good, but I like the added sweetness and rice flavor. You can use frozen hash browns for the chopped potatoes. If you catch some hybrids, they will be too strong for this mild chowder. Bass or crappie are much better. Strong oily fish like hybrids are better in tomato based stews. This entry was posted in Fish Recipes, How To on September 19, 2014 by ronniegarrison. Can I Catch Bass On An Ice Fishing Jig In the Summer? After grabbing an early lead in a Bassmaster tournament last month, Brandon Palaniuk told the media he was keeping details of his tackle and tactics “locked down for now.” It’s time to bust out the key and set his secret free. In the heat of the summer he caught ’em on an ice-fishing bait – a Rapala Jigging Rap®. When fished through the ice as they were designed for, Jigging Raps work best with a vertical pump-and-swim action. A successful open-water presentation, however, requires aggressive rod snaps throughout a horizontal retrieve. After weighing a 20-pound-plus five-fish limit to lead the first day of the Bassmaster Elite Series tournament on New York’s Lake Cayuga in late August, Palaniuk told Bassmaster.com he was fishing a pattern he had all to himself. It’s likely those Empire State bass hadn’t seen anything like a Jigging Rap before – at least not in the summer. The Jigging Rap’s unmistakable minnow profile features single reversed hooks on the nose and rear – so regardless of how a fish attacks, it’s running smack-dab into a hook. A center treble hook – hung from a belly eyelet – further increases your hook-up ratio. Fishing much deeper than most other competitors on Cayuga, Palaniuk saw only one other angler during the tournament. Targeting smallmouth, he ended up catching both brown and green bass off of two small rock piles in about 25 feet of water. A shell bed extended from the rock pile area down to about 40 feet. “The fish would stay anywhere from that 25-foot to that 40-foot zone,” he says. Palaniuk found fish in those spots in the two-and-a-half days of practice before the four-day tournament began. Despite being able to see them clearly on his depthfinder, however, he couldn’t get them to bite at first. But on the last day of practice, inspiration struck. It was a No. 7 size Jigging Rap in the Glow color pattern – white with a chartreuse head. He threw it on a 7-foot, medium-action spinning rod spooled up with 8-pound-test braided line attached to an 8-foot, 8-pound-test fluorocarbon leader. After dropping the Jigging Rap a few more times and shaking off a few more bites, he determined he’d found a school of 4-pounders. Ultimately, the Jigging Rap bite did not yield enough big fish for Palaniuk to win the tournament – he ended up placing eighth – but it did account for several of the fish he weighed and helped clue him into a couple other ways to get bites. Based on the way bass had been biting the Jigging Rap in practice, Palaniuk decided on the first day of the tournament to stroke a 1-ounce Terminator Football Jig, rather than crawl it across the bottom, a more traditional presentation. That decision led to a 20-pound, 1-ounce limit and the Day 1 lead. Although many believed, going into the tournament, that shallow-grass largemouth would be the ticket to success on Cayuga, Palaniuk – true to form – opted to target deep-weedline smallies. As it turned out, however, he caught both smallmouth and largemouth from his deep spots. Brown and green bass were “pretty evenly mixed in the school,” he says. This entry was posted in Bass Fishing, How To, Tournament Fishing on September 18, 2014 by ronniegarrison.